Happy Thursday, friends! I'm keeping it short and sweet today. Today I am thankful for loose-fitting dresses that I can stretch out and not feel bad about. I'm also thankful for cardigan sleeves that I can roll a little bit since I burned a whole in one of the sleeves and I just love the color so much I can't give it up. In all reality, I am so thankful that my husband is home. He started his last semester of his MBA this week, so things have been busy, but it's just really nice to come home to the same house every evening. Last night we had sushi with friends (cooked again, don't worry! ), pushed a stroller around and talked about baby names ("Porky" and "Winston jr" seem to be top contenders). A perfect evening. how did you burn a hole in one of the sleeves?! love the dress, looks great on you! Hahaha oh man - at a wedding! I set the cardigan down by a fireplace. Not even a good story! The only baby names we can even come up with are jokes, so I really doubt he'll have a name any time soon! Sounds like the perfect night! Cute dress! Yellow looks great on you! Porky! Our youngest daughters nickname is Stinky. Cute outfit btw. I LOVE that necklace :) Looks great with your whole outfit! Porky has my vote! That necklace is perfect! 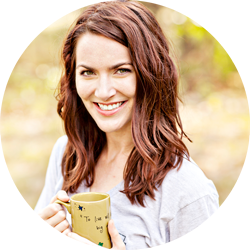 I am just totally loving seeing these blog babies grow! You look adorable!! 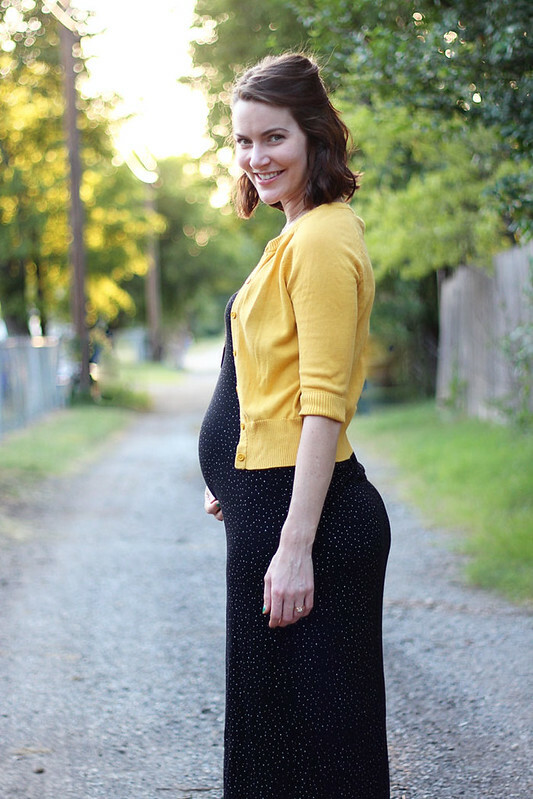 I just discovered H&M maternity and am in love! You seriously look gorgeous here. Oh Porky for sure! 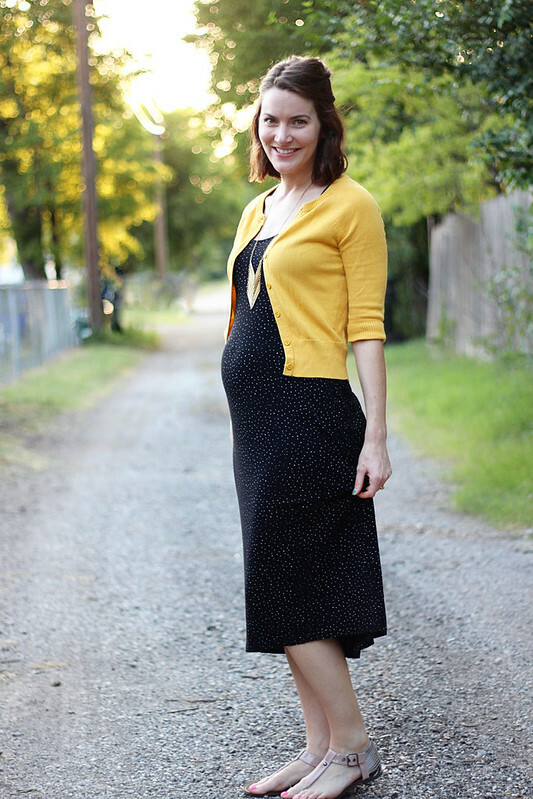 I love this mustard cardigan with your black sparkly dress! 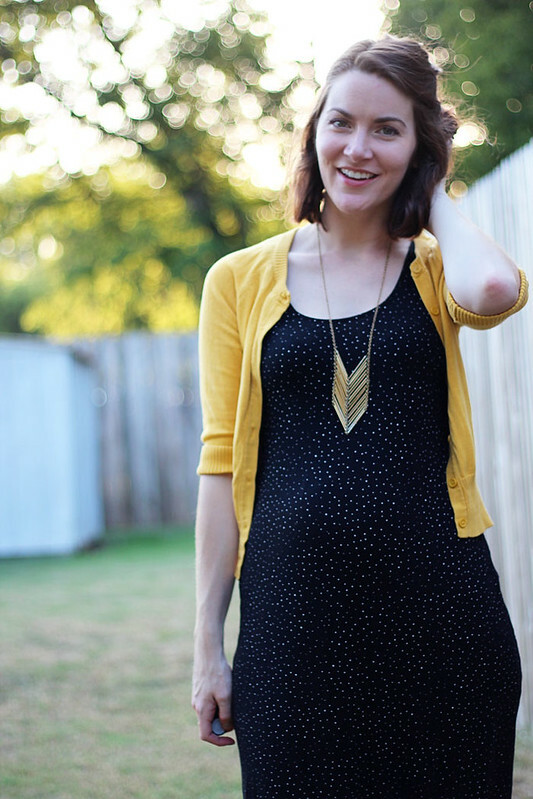 Perfect pairing with the mustard and polka dots. You really can never go wrong with mustard. Oh I haven't been by for a while - can't believe you are 26 weeks already! You're looking incredible! 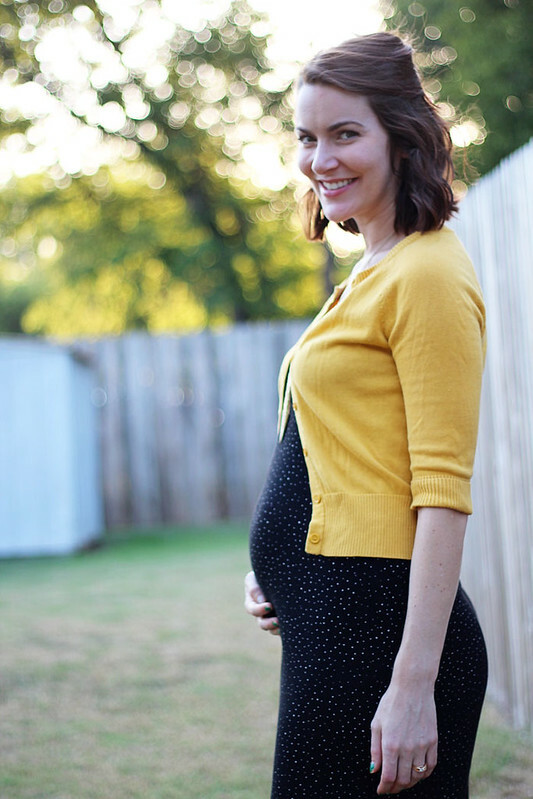 Such a sweet little bump, Ashley!! That bump is adorable. So glad your hubby is home and you two are getting to enjoy some relaxing evenings together.